Signature Arts, Inc.: The 100 Day Volunteer Certificates & the Proliferation of Facsimile Abraham Lincoln Signatures! 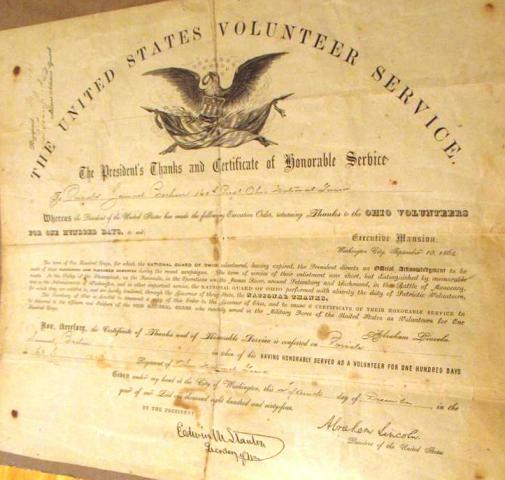 The 100 Day Volunteer Certificates & the Proliferation of Facsimile Abraham Lincoln Signatures! In the fall of 1864 thousands of Union volunteers who served a hundred days of service that summer were issued a certificate of thanks by the War Department --an impressive looking, partially-printed, engraved document, bearing the signatures of Secretary of War, Edwin Stanton, and the President, Abraham Lincoln. Other than clerical editing and transcription on the document, all text on the document is printed, including the signatures of Stanton and Lincoln. In the century and a half that's followed the issue of the certificate, perhaps no Civil War era document bearing Lincoln's signature has been the source of more confusion and fraud, and subsequently, bought and sold as authentic by seasoned dealers, auction houses, and collectors. Even more disturbing is the trend over the past decade of destroying the certificates for Lincoln's, and to a lesser extent, Stanton's, signatures. Authentic American Civil War documents have been routinely mutilated by a handful of unscrupulous dealers-clipping the facsimile signatures from the documents and selling them as real. The Hundred Days Men, or 100 Day Volunteers, was the nickname for the short-term, volunteer enlistments mustered in the summer of 1864 for 100 days of service in the Union Army during the American Civil War. These lightly trained troops were intended to free veteran units from routine duty to allow them to go to the front lines for combat purposes. The concept of the hundred-day volunteer was first proposed by the Governor of Ohio, John Brough, in the spring of 1864. Brough was concerned with Confederate incursions and invasions of the North, such as Brigadier General John Hunt Morgan's cavalry raid into Ohio in 1863. Brough's idea was to federalize the state militia into service for a period of 100 days to provide short-term troops that would serve as rear echelon guards and laborers to free veteran units for combat duty. This would increase the number of fighting men in the Union armies campaigning in the South, which, ideally, would achieve victory for the North within one hundred days. Brough contacted the governors of Indiana, Illinois, Iowa, Wisconsin, and New Jersey to do likewise in an effort to raise 100,000 men. They submitted their plan to Secretary of War Edwin M. Stanton, and the proposal was immediately approved by President Abraham Lincoln. In total, approximately 81,000 men were mustered for a 100-day period. Over 35,000 were federalized from Ohio alone. The remaining numbers were primarily from Indiana, Illinois, Iowa, and Wisconsin. These veterans became known as Hundred Days Men. Unfortunately for the North, the primary objective of the Hundred Days Men-defeating the South within one hundred days-fell short by a few months. Nevertheless, in recognition of their efforts, at the end of their duty the Hundred Day Volunteers were issued a certificate of service by the War Department. 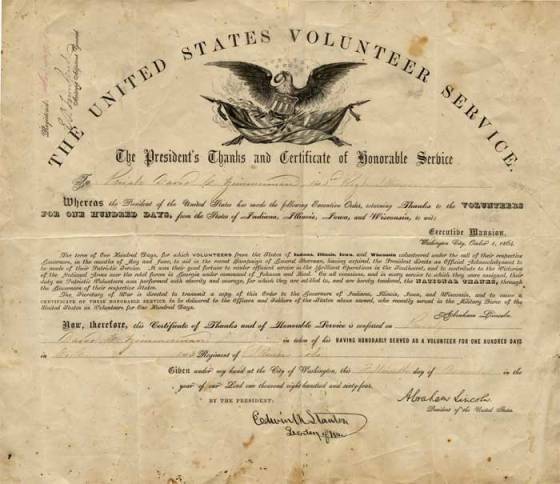 These documents, a "Certificate of Thanks," were issued to the tens of thousands of men who had volunteered. They were partially-printed, with "THE UNITED STATES VOLUNTEER SERVICE" arcing across the top margin over an ornately engraved eagle clutching the American flag. There were at least two versions of the document printed. One version recognized the men who volunteered from the states of Indiana, Illinois, Iowa, and Wisconsin inclusive; another was issued exclusively for the men of Ohio (presumably because of the high volume of volunteers from that state). Signatures of Secretary of War, Edwin Stanton, and President Abraham Lincoln appear at the bottom of the document. Like other partially-printed, original, presidential documents from the Civil War, personal information--names, dates, rank, etcetera--was filled in by a clerk's hand. However, not original are the signatures of Edwin M. Stanton and Abraham Lincoln. Their signatures were prepared from traced engravings onto the printing plate as part of the form document. Over the years copies of the Hundred Day Volunteer certificates have gradually entered the autograph marketplace as authentically signed Lincoln documents. It's understandable why. To the trained or untrained eye, at first glance, without several certificates to compare with, the signatures of Lincoln and Stanton appear to be original. On close inspection, however, what stands out is the contrast in ink between the clerical writing and the rest of the document. The iron-based ink from the clerk's hand has rusted and turned brown and relatively faded with age. Secondary is the uneven flow and impression one would expect from handwritten script. In comparison, the facsimile signatures of Lincoln and Stanton, perfectly imprinted onto the document, are the same color ink and age-toned as the printed text of the document. Though naïve, unsuspecting, and yes, unscrupulous dealers and collectors alike have bought and sold the volunteer certificates as original Lincoln Documents Signed, in recent years awareness of the printed signatures on the document has grown. The practice of has been stemmed in large part by the informative efforts of honest dealers and auction houses, and websites like the Illinois Historic Preservation Agency <http://www.illinoishistory.gov/signature.htm>. The practice that does continue, and what dealers and collectors need to be aware of, is the printed Lincoln signatures that have been cut from the document and sold as authentic full Abraham Lincoln signatures. These signatures were sold into the marketplace in the late 1990s and early 2000s by a handful of unscrupulous dealers via the web. The rise of online auctions, in particular eBay, with no checks, standards, or independent, qualified authenticating authority, allowed for the proliferation of the facsimile Lincoln signatures. If you're still uncertain check for traces of possible dot removement. There may be instances where a dealer may have tried to remove the dot to make their signature look different, or may have clipped the period off which would render the "n" in Lincoln at the very edge of the right margin. It is certain that there are many presidential autograph collections with the facsimile Lincoln signature in them. It's only a matter of time before the generation of collectors who acquired these signatures as authentic begin to return them to the marketplace. Every effort should be made to trace back to the originating source of the signatures to compensate the victims down the line. If your Lincoln signature matches the one above return the signature to the dealer for a refund. It is important, at this juncture, for the autograph community to recognize and weed out the facsimile Lincoln signatures from the marketplace. Whether intentionally or innocently, the continued selling of the facsimile Lincoln signature by anyone at any level is a discredit and blow to the hobby.